The small but fast-growing Cambodian provincial capital of Siem Reap is one of the world's major tourist destinations due to its location as gateway to the unique Khmer temple complex of Angkor Wat, a UNESCO World Heritage site. The town of Siem Reap is a shopaholics' dream, particularly for Cambodian silks and other textiles. Handicrafts, contemporary art, carvings, decorative items for the home, silver items, traditional stone carvings and lacquerware, incense, candles, souvenirs and clothes are also a great deal. The Khmer people are traditionally friendly to Westerners, perhaps because of the country's 90 years as a French protectorate. The recent explosion in the number of tourists visiting the area has also had an effect, with more local people working in the hospitality sector making the effort to learn English. As the town has expanded, so has the eating out experience in Siem Reap. Nowadays restaurants cover everything from local Khmer dishes through Southeast Asian cuisines to upscale and high quality fusion and international food. A few restaurants, mainly expensive, serve interesting food which mixes French gastronomic traditions with Khmer cuisine. Even excluding the over 100 temples in the Angkor Wat complex, there is a great deal to see and do in and around the town. Visits to other religious monuments, markets, Tonle Sap Lake with its floating villages, the Angkor National Museum, the Cultural Village, bird-watching, yoga and cooking classes, environmental tours, countryside tours and much more make Siem Reap a tourist paradise. 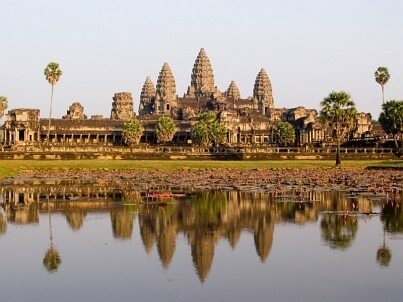 Visitors to Siem Reap are spoiled for choice as regards entertainment. Whether it's the lively nightlife in Siem Reap's numerous bars and clubs, cultural performances, art galleries, sport, educational sites, spas, massages, eco-tourism or traditional events, there's something for everyone somewhere in the town and its surroundings.